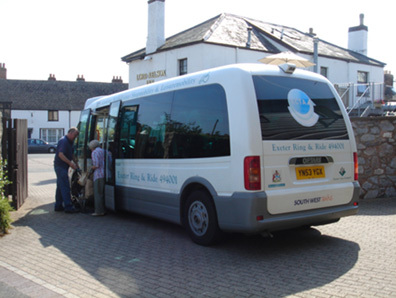 Ring & Ride provides a door-to-door, wheelchair accessible minibus service for people who are having difficulty using local buses. Ring & Ride is for anyone who is having difficulty using the ordinary bus, perhaps because the stop is too far away to walk, or because the bus steps are too steep. Our bus has a tail-lift for wheelchair and walking frame users. Telephone us between 10am and 4pm, up to a week before and not later than the previous day to book your seat. The bus collects from different areas of the city on different days of the week - see ¨What day can I travel¨ for more information. The driver will pick you up from your home and help you board the bus if requested. The fare for a single or return journey is £3.50 per trip (and £3.70 to Broadclyst on a Friday) . You may bring a companion and they pay the same amount. You pay our driver on boarding the bus. The driver will bring you into the City Centre, or link with Exeter Shopmobility for wheelchairs or scooters in Paris Street. 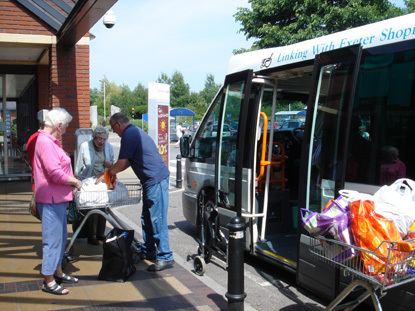 For at least one week in every month the bus takes passengers to local supermarkets. The bus will collect you where it leaves you, after a stop of about two hours. Our driver will be happy to load your shopping onto the bus and assist in carrying your bags to your front door, all you need to do is ask! Ring & Ride also organises excursions and lunches to local places of interest. Please call the office on 01392 494001 for details. Download our Ring & Ride leaflet here. We currently lease our Ring and Ride bus from Devon County Council. To give us more freedom, we are endeavouring to raise funds to purchase our own bus. Should you be in a position to make a donation, or help raise funds in any way, this would be greatly appreciated.